Casa Serena is located on the edge of the peaceful vacation house settlement of Monaco Mirante - not far from the coastal resort Campomarino - in a rural environment between gardens and dunes; it is only a few minutes walk to the stunning, child-friendly natural beaches on the Ionic Sea. From the lush, green garden, you can get directly into the cozy living room through the large covered patio - here you will find an equipped, open kitchen. The living room with dining table and sofa is just as cozy and friendly furnished as the three bedrooms. The bathroom in the bedroom has a shower, WC, bidet and sink; a second, complete bath can be reached from the courtyard; here you will also find the washing machine for the tenants. The house is air conditioned. In addition to a powerful heat pump machine for the cooler seasons, there is also a wooden oven in the living room for heating. The roof deck with chairs and an airy sitting place offers a wide view above dunes and sea. Come in and benvenuto: Enjoy your holidays from the very first moment on. 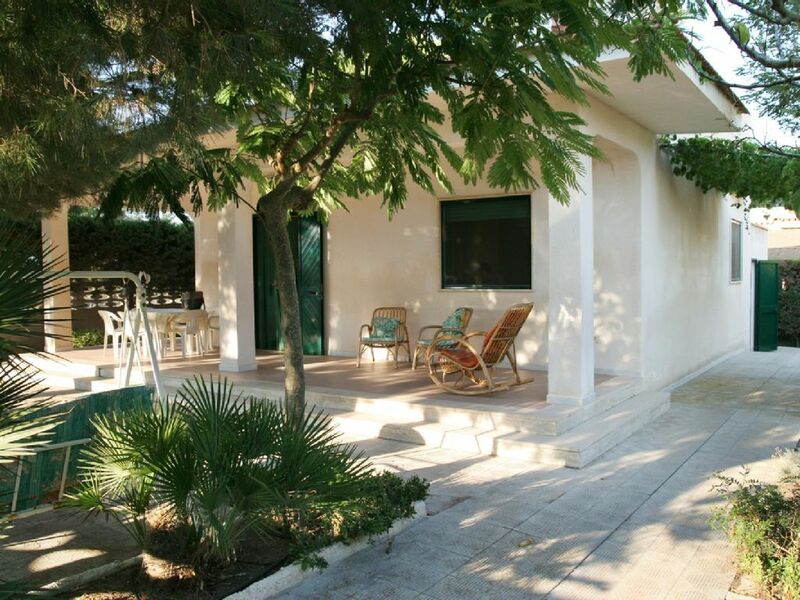 Your holiday home is spotlessly clean and well appointed, your beds are made and as your introduction to the delights of Puglia you will find your first bottle of local red wine welcoming you on the table. If you want, send us a shopping list and you’ll find everything you need for your first Italian meal in the kitchen. Anything else we can do? No problem! Welcome to Puglia - enjoy yourself! be mobile: If you arrive by plane or train and do not want to rent a car, we can arrange for you to be picked you up at the airport or station (at cost price, petrol and driver). We do recommend for you get your own mode of transport. We provide you with bicycles (inclusive), which are perfect for smaller tours and the daily shopping. You should rent a car at the airport. You can also rent our two motor scooters. Please ask for availability and pricing. english, french, german, spanish, italian, dutch, German, French, Dutch, Spanish, English, Italian. Vielen Dank für diesen wirklich erholsamen Urlaub!! The stretch of the coast 'the dunes of Campomarino' was early labelled as a special, valuable natural legacy and is under nature protection. In the middle of this nature reserve region you will find 'Monaco Mirante'. This small settlement is made of houses scattered in the dunes and gardens and is exactly the right place for people that want to rest and relaxation in a natural environment. Through small paths that go through the back-country through vineyards and century-old olive trees you will find the typical Apulian city of Maruggio in a 15 minute bike ride with its friendly and open residents. Here there are all shops that you need. The coastal resort Campomarino has cafes and restaurants and is easy to reach with bikes - which we provide for free to our guests. Monaco Mirante is a good starting point for half and whole day excursions to the many extraordinary attraction in Apulia (multiple world heritage sites).